Magpies, crows, ravens and even eagles aren’t labeled scavengers for nothing, and as such, they can lead a savvy hunter to the predators that make the kills upon which these birds feed. Lloyd Anderson, one of the best government trappers I ever met, once told me that while not every magpie has a coyote or cat, every bobcat and coyote has its magpie. So, when a magpie flew up out of a draw on the oakbrush hillside above the highway, I decided to pull over for a closer look. A short uphill hike later, I was standing over a freshly killed spike mule deer buck. Tracks in 3 inches of fresh snow showed where a large bobcat had ambushed the buck and then killed it as it lunged downhill. The kill was only a few hours old, and I figured I’d either run off the cat or it was somewhere nearby, laying up with a belly full of hindquarter, perhaps watching me. Had this occurred a few years before, I might have returned with hounds to loose on the smoking hot track or set some snares in the oakbrush around the carcass. However, I’d gotten rid of the last of my cat and bear hounds after animal rights groups had gotten spring bear hunting, and the use of dogs, outlawed in Colorado. The same bunny huggers had managed to mislead the unwashed masses into voting out trapping, too. The “leadership” at the Division of Wildlife had stood by (no doubt all the while drawing handsome wages being paid by hunting and fishing license sales) doing nothing to help sportsmen in either instance. But I digress, and I still had one good way left to try to add that prized cat pelt to my collection. I figured the big tom wouldn’t leave a kill that fresh, so the next morning, I parked around a bend in the canyon half a mile below and climbed to the top of the rocky ridge. I approached the rim and then crawled slowly out to a rocky outcropping, where I had a clear view of the canyon below. The kill was out of sight in a small side canyon 125 yards below, slightly up-canyon from me. I patiently waited half an hour for things to settle. At that distance, I knew a bobcat’s keen vision could pick out the slightest movement, so I moved sparingly in extreme slow motion. Several magpies in the trees but none on the carcass told me the cat probably was close enough to keep the birds at bay. My little CZ .223 was solidly rested on its Bog Pod when I eased the high-pitched cottontail call to my lips and sent a series of plaintive squeals and squalls down the hillside. I typically “feather” the call to vary intensity and volume, but I didn’t dare move that much and simply muffled the call with my hands. The sound was still echoing down the rocky defile when I caught movement a dozen yards above the kill site. The bobcat had jumped onto the rocky ledge he’d no doubt been bedded under and stood there trying to locate the source of the sound. That’s all I needed—another case of curiosity killing the cat. Bobcat prices have been holding high for some time now, and while cats aren’t easy to call, unless you run hounds or trap, the best way to add the prized pelts to your collection may be with calls, shotguns and scoped varmint rifles. Cat calling is a different ballgame. Bobcats will respond to general predator calling, but the closer you target the feline’s unique hunting and survival habits, the more prime pelts you’re going to put on the stretchers. Texas, without a doubt, has some of the densest bobcat populations in the country, and while the fur quality doesn’t approach that of Colorado or Wyoming high-country cats, a rising if still-modest market for Southern skins has made Texas a cat-caller’s paradise. Gary Roberson, owner of Burnham Bros Game Calls, spends a lot of time calling Texas bobcats for his Catastrophic videos and for various TV hunting shows. Gary confines his cat calling to rough country—the brushy thickets and creek bottoms inhabited by the small prey that make up a major portion of a bobcat’s diet. Gary’s “secret weapon” for bobcat calling success is plain old patience. When he sets up to call bobcats, he plans on staying 30 minutes, minimum, and often stays an hour in good bobcat habitat. He gets comfortable enough to remain nearly motionless during the entire drawn-out calling session, to avoid detection by a bobcat’s gleaming eyes. Large, mature cats are most aggressive and may respond to a call on the run. But younger, smaller cats are more likely to take the slow, sneaky approach. They appear seemingly out of nowhere. I can’t tell you how many times my first inkling that a cat was coming was the sight of it sitting calmly a few yards away, perusing the area. Gary prefers an electronic caller, and his favorite sounds are higher-pitched and excited, such as a cottontail duet or a yellowhammer woodpecker. Rodent and bird sounds are most attractive to bobcats, again, because they make up a major portion of the cats’ diet. Gary likes a shotgun for close-quarters shooting in the thickets. In more open country, he likes a .223 loaded with Winchester 35-grain lead-free bullets. The small but fast-stepping bullet puts cats and coyotes down cleanly with no exit hole and minimal pelt damage, a real advantage when you want to sell the fur. Byron South, another well-known Texas predator pro, travels extensively around the country calling and video-taping hunts for Mojo Outdoors. Byron also confines his cat calling to ideal territory. Also same as Gary, he is not overly concerned about wind direction when calling cats. Unlike coyotes and fox, cats depend on phenomenal eyesight rather than a keen sense of smell. Cats often come in from downwind, seemingly oblivious to the hunter’s scent stream. Of course, the same cat will pick up the movement of a hand feathering a mouth call at 100 yards or more. The bobcat may not spook but will then approach only at a glacial pace, hanging up and simply waiting to see what develops. Nothing is more patient than a stalking bobcat. To reduce the wait, Byron tries to get as close as possible to the cat’s suspected location before calling. He spends a lot of time scouting areas to pinpoint likely bobcat lairs. He prefers a remotely controlled caller set 30 to 40 yards out to keep the cat’s attention off of him and on the sound. On numerous occasions, Byron has taped cats stalking callers, including a curious cat that came right up to the speaker, intent on identifying the strange source of sound. To further focus the cat’s attention on the caller, Byron uses a decoy, especially in more open areas where a cat might be hesitant to come in without this visual enticement. Byron likes the classic cottontail rabbit sounds and lets the electronic caller run full time on low volume. He knows that patience is a virtue but also admits he simply doesn’t have enough of it to sit motionless more than 15 or 20 minutes in one location. Because he gets “on target” before calling, most of his cats respond within 5 to 10 minutes, yet he knows he probably misses out on some cats that come in after he has moved. He generally only moves 300 yards or so rather than the longer distances he moves from stand to stand when calling coyotes. In heavy cover, Byron likes a shotgun loaded with BB shot. An AR-15 loaded with .223 Hornady 50-grain V-Max bullets gets the nod in more open areas. Al Morris hails from Utah and spends every available day in the fall and winter hunting predators and shooting video for various companies and TV programs. He is a hard-core contest caller with several championships under his belt. Al also is a firm believer in hunting bobcats in the heavy cover along river bottoms, in rocky canyons and brushy draws. He also works the brushy edges of vast CRP fields in prairie country, and he said that even in this open range, bobcats tend to be homebodies. Al also likes a remote-controlled electronic caller with decoy. He prefers bird sounds, such as Foxpro’s Lucky Bird, Nutty Nuthatch, and Sylvester Tweety. Bobcats everywhere feed heavily on small brush-dwelling birds and rodents. Like Byron, Al has a hard time staying put for long. A 20-30 minute stand is about all he can stomach. Also like Byron, he readily admits that longer stands are not time wasted and that his early exits probably cost him an occasional cat. Al especially likes tight cover where tracks or other sign indicate the presence of cats. Once he determines he’s in good cat country, he works it from stem to stern. According to Al, cats are very territorial and often won’t cross out of their comfort zone or home range to respond to a call. Small changes in position can make a big difference. At most, he will move 400 or 500 yards between stands, and he does most of the calling at low volume. Al’s favorite bobcat rifles are a .223 shooting a 55-grain bullet and a .22-250 pushing a 50-grain slug. Bobcats seem to be expanding their range and multiplying in many areas of the country, perhaps a result of reduced trapping pressure. In Iowa where I have deer hunting leases, myself and my clients see bobcats on an almost daily basis. I believe the cats are starting to hurt the turkey population, yet Iowa officials remain very protective of their bobcats and limit a hunter/trapper to one a year. They also require a $200 nonresident furtaker license to hunt or trap that single cat. In addition, Iowa enforces a low statewide quota that is often filled in a couple of weeks or less. When I bought furs, some of the most beautiful and valuable bobcat (lynx cat, in fur-trade vernacular) came from Nevada. The state didn’t even require a license for predator hunting. According to Al, Nevada still is a great place to trap or call cats, but only if you live there. 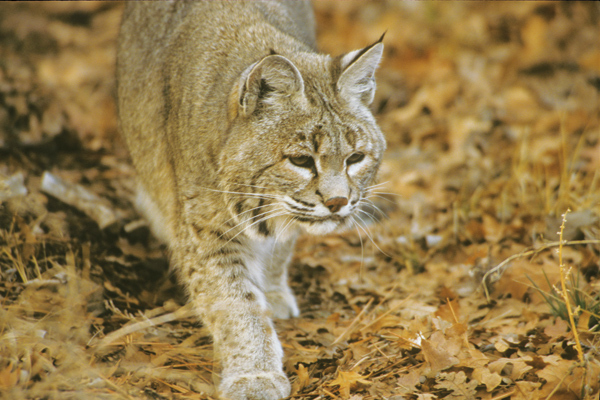 The state does not allow nonresidents to harvest bobcats under any circumstances. Al said 11 Nevada bobcats came to his calling last season, and he had to watch them all walk. This protective attitude prevails in a lot of states. Al’s home state of Utah is full of bobcats, yet it only allows five a season, for residents and nonresidents alike. Nonresidents have to apply for the five-cat permit before the season opens. Colorado may not allow trapping, but it does allow predator hunting, including cats. The nonresident license fee is $56 plus a $10 habitat stamp. ’Most every state classifies bobcats as furbearers, and as such requires a trapping or hunting license and perhaps also a furbearer stamp. So check carefully for specific license requirements and other season details. Dan Thompson, a long-time Wyoming predator caller who has taken hundreds of bobcats, also does his cat calling in areas of heavy cover—especially the rimrock and river-bottom cedar thickets that harbor the small critters bobcats crave. Dan prefers high-pitched mouth calls and tries to put as much panic and distress as possible into the sound. One of his favorite cat calling “tricks” is to use the tip of an open-reed coyote howler to make ultra high-pitched sounds. Dan also likes to use a motion decoy when calling cats, as long as the movement is smooth and natural so as not to make an approaching cat hang up. Dan prefers the hot little .17 Remington Fireball for cats, loading a Berger 25-grain hollow point. The cartridge is superbly accurate, deadly, and does little pelt damage. He totes a shotgun loaded with No. 4 buckshot in heavy cover. When I was buying furs, I was always amazed when hunters brought in what should have been high-dollar cat pelts covered with blood, with bullet holes, rips and tears. They lost hundreds of dollars when a bit of time washing and brushing, a few minutes with needle and thread, could have turned those $75 bobcats into No. 1 lynx cats worth $300 or more. This is a prized pelt, and it is well worth expending the effort to make that fur as beautiful as it deserves to be.